This lesson unit is intended to help you assess how well students are able to interpret data using frequency graphs and box plots. In particular this unit aims to identify and help students who have difficulty figuring out the data points and spread of data from frequency graphs and box plots. It is advisable to use the lesson: Representing Data with Frequency Graphs before this one. Before the lesson, students individually complete an assessment task that is designed to reveal their current understanding and difficulties. A whole-class introduction gives guidance to students on how to work during the collaborative activity. 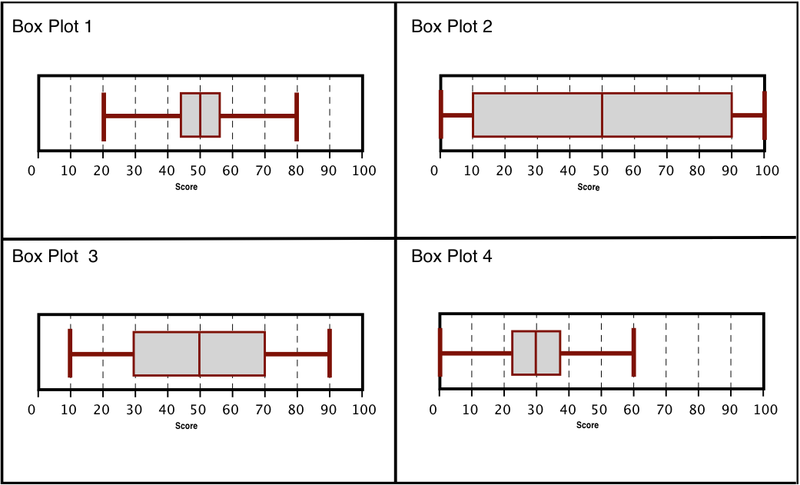 Students then work in pairs or threes on a discussion task, matching frequency graphs to box plots. The lesson ends with a whole-class discussion. In a follow-up lesson students work alone on a similar task to the introductory assessment task. Each student will need a copy of the tasks: Cell Phones 2 and Cell Phones 2 (revisited), the handout Matching a Box Plot to a Frequency Graph, a rule, mini-whiteboard, pen, and eraser. Each small group of students will need Card Set: Frequency Graphs and Card Set: Box Plots (both sets cut-up before the lesson), a large sheet of paper for making posters, and a glue stick. You may want to copy the two Card Sets onto transparencies to be used on an overhead projector to support whole-class discussions. There is also a projector resource to help with whole-class discussions. If you are teaching the lesson as a sequel to the lesson Representing Data with Frequency Graphs you will not need Card Set: Frequency Graphs or a sheet of paper for making a poster, as students’ existing posters include these cards. Approximately 15 minutes before the lesson, a 1-hour lesson, and 20 minutes in a follow-up lesson. Exact timings will depend on the needs of the class.